A review of this fabulous two CD set is impossible without mention of the man who made the recordings in the first place. The spirit of the late Keith Summers shines through these recordings like a diamond in snow. Keith was a man who smoked a lot, drank a lot, managed to annoy a lot of people and was the epitome of the good old boy; a phrase he was very fond of applying to others. What better character then to elicit a song from the reluctant singer? He was no great shakes as a singer himself (although he could 'perform' a song magnificently) so he had nothing to offer the singer in exchange but good humour and good fellowship, both of which he possessed in abundance, plus an unerring nose for a good time. His notes in the accompanying booklet are pure Keith - they are informative, always to the point, funny, chatty, knowledgeable and self-deprecating. They are a pleasure to read. They told me exactly what I would need to know about the recordings and, on at least one occasion, they made me laugh out loud. They prove a very winning account of the combination of luck and tenacity that must prevail among song collectors. Now Keith states that he was never a great expert on the huge subject of Irish music and song and neither am I. I can only describe what I hear. And what I hear is a quite remarkable collection of singers and unusual songs. The subtitle of the collection - 'Football, hunting and other traditional songs' is somewhat misleading. Of the thirty seven tracks, only two are football songs and four are hunting songs. Now I have to say that I loathe hunting and have always been baffled by the allure of football (and every other form of sporting activity, for that matter). I do, however have a fond regard for hunting songs and those here are outstanding. The football songs on offer aren't half bad either (even if I don't understand them! ), particularly the title track with its rousing chorus with which I assume everyone would usually join in (sound clip). Perhaps they did not here in deference to the tape recorder. Of the hunting songs, the standout track for me is The Grangemoor Hare sung by Patsy Flynn, a lovely singer in the Kevin Mitchell style (sound clip). 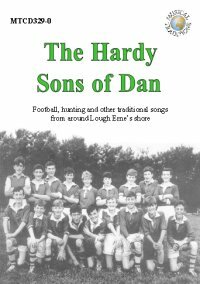 Running a close second is The Huntsman's Horn sung by Paddy and James Halpin a terrific father and son double act whose To Reap and Mow the Hay was one of the highlights of the Voice of the People CD set, and the song reappears here. Although it is a different recording to that on the Voice of the People, the performance is uncannily the same (with minor changes in the lyrics) - slightly ramshackle and utterly endearing unison singing. Their piece de resistance, however, is the astonishing The Kildallan Brown Red, a richly detailed song about organised bird fighting (sound clip). Of the other singers, the most notable is Maggie Murphy, as she would be anywhere, and particularly her lovely version of Molly Bawn (sound clip). She has a strong clear, rhythmic style that suits me down to the ground. In fact, all the singers are great. I suppose the nature of the beast means that some singers do not get as much space as others. I long for more of Eddie Coyle, whose only track is the last one, The Little Old Mud Cabin on the Hill, a great closer, sung in good company which needs little encouragement to join in. Philip McDermott only has one song (according to the notes, he only knew two), The Reaping of the Rushes Green, a haunting song sung in a lovely lilting style. He is quoted in the booklet about his mother - “People tells me that I can't sing it nearly the way she could sing it”. She must have been some singer! Tom Tinneny is represented only by The Clones Murder. Well into his nineties at the time of the recording, he delivers a spirited performance.